Today is Sunday and it's my cooking day. My man is down south riding round in circles for the Cyclo Sportif ad I am at home,enjoying the quiet, except for when I've been buzzing chocolate ice cream 'custard' in my new ice cream maker! Yes, today is a lazy shuffle round the kitchen day. 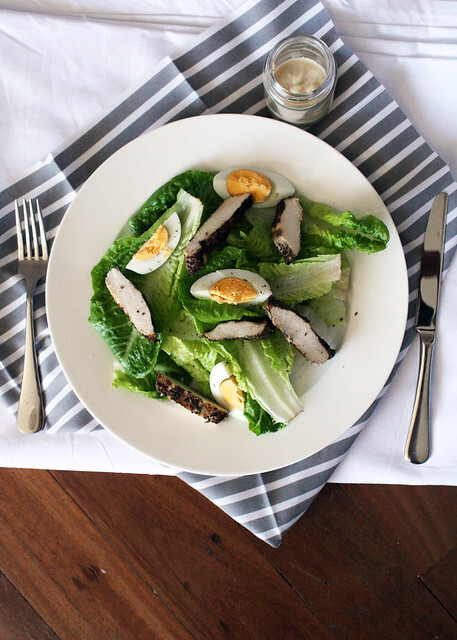 It is accompanied by simple food like this easy egg & chicken salad. It's high in protein so I won't need to nibble at my baking endeavors (but I will anyway), low in fat (to make p for the nibbling) and simply scrummy, oh, and it's gluten free - of course! So, relax, have a cuppa read a magazine or go bake a cake after you've put a few eggs on to boil and make this easy peasy egg & chicken salad. Coat the chicken breast in the mixed herbs and a little salt and pepper. Pan fry. Meanwhile place the eggs in a pot and cover with cold water. Bring bring to the boil then reduce heat slightly cook for approximately 10minutes for a hard egg, less for a softer one. Rinse under cold water and peel. To make the dressing combine all the ingredients in a small bowl and whisk with a fork. Add pepper to taste. Check seasoning and adjust to your liking. Cut the cooked chicken into piece and place on the freshly washed leaves add the chopped egg, pour over or toss in the simple dressing and season with salt and pepper.